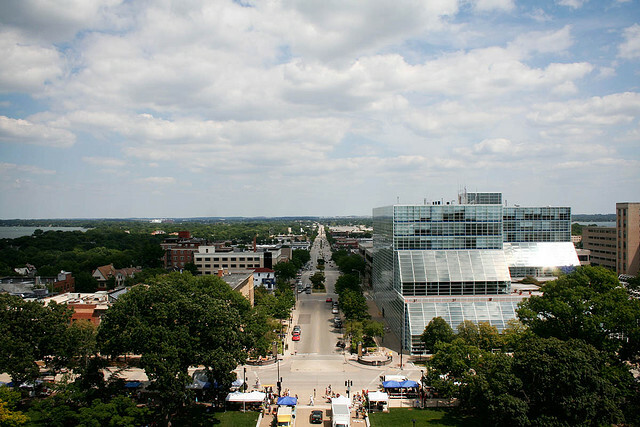 Madison, Wis. has the most parks per capita in the United States, with 12.7 per 10,000 residents. Photo by Jonathan. The Trust for Public Land’s Center for City Park Excellence released its annual review of U.S. city parks. This year’s report includes data on a total of 22,493 parks from the country’s 100 biggest metropolitan areas. The report’s biggest takeaway is that 120 new urban parks were created in the U.S. this past year despite a nationwide decrease in park operations and maintenance funding. Half of the cities in the report experienced decreases in funding, culminating in a 3.9 percent decrease in full-time park employees. According to researcher Peter Harnik, roughly $5.8 billion in scheduled park repairs and maintenance have been postponed because of financial constraints. The growth in the total number of parks was aided by an increase in capital, as opposed to operational, funding. This capacity-building financial support increased by 4.6 percent between 2009 and 2010, with help from federal stimulus funding. Total automobile air emissions in the 86 largest metropolitan areas in the U.S. cost a total of $145 million each day, according to a new study from a Carnegie Mellon and Arizona State research team. The team studied the monetary impact using county-specific air emission morbidity, mortality and environmental costs. Among the cities studied, total U.S. auto air emissions cost $0.64 per person per day and $0.03 per vehicle mile traveled. Los Angeles and New York City recorded the highest costs associated with emissions, with each accruing about $23 million per day. The study did not include information on auto emission abatement costs. The Institute on Taxation and Economic Policy released a new report, “Building a Better Gas Tax: How to Fix One of State Government’s Least Sustainable Revenue Sources.” The report argues that state gasoline and diesel taxes are the most important source of transportation funding under the control of U.S. states and that they are in need of adjustments to account for monetary inflation. By considering the rise in construction costs associated with inflation, the report estimates the average state’s gas tax has effectively dropped by 20 percent or 6.8 cents per gallon since its last increase. These foregone revenues across the country’s states amount to roughly $10 billion per year. The American Society of Civil Engineers (ASCE) calculates that this revenue loss translates into a $130 billion drain on the economy through the areas of higher vehicle repair costs and travel time delays.